David Inshaw is a pre-eminent British artist and also one of the top print artists at Red Rag Gallery and 'The Badminton Game' is one of the top selling prints. 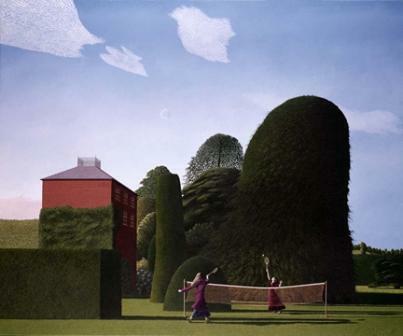 The 'Badminton Game' is an open edition art print which has been reproduced from one of David Inshaw's most admired paintings. The painting is now in the Tate art gallery permanent collection. It was originally called 'Remembering mine the loss is, not the blame', a title taken from a poem by Thomas Hardy: She, To Him. It is one of a number of Inshaw art works influenced by the landscape of Wiltshire and in particular by houses and gardens in Devizes of which Inshaw has written of 'the mystery and wonder I felt all around me in this magic place'. Inshaw says: 'It was the first picture I made that had a Devizes 'feel'� about it, although the elements that go to make up the picture relate to some things that went on before I moved to Devizes in the autumn of 1971. I had moved to Devizes for a number of reasons, to get away from Bristol, a place I love, but the art school where I taught seemed to be taking more and more of my time. All David Inshaw art prints from Red Rag Art Gallery have been reviewed by the artist. This guarantees that all art prints offered by Red Rag satisfy the high quality and fine art standards set by David Inshaw for prints. Each print from the Red Rag British Art Gallery is normally available for immediate delivery and can be shipped worldwide. To see the range of David Inshaw limited edition prints click on the link above.